From our experience we recommend considering arriving in Auckland a couple of days prior to the tour especially after a long flight from overseas so as to overcome your jet-lag and be ready and fresh for your New Zealand Adventure. We will meet and greet you upon your arrival at the Auckland International Terminal in Auckland, or your hotel if you have arrived earlier. Once you have cleared Customs we will load up and drive via Auckland City to connect with State Highway 1 and travel along the the Twin Coast Discovery Highway, a pleasant drive of around 2 hours with plenty of photo opportunities. We arrive at our destination – the largest city in Northland – Whangarei late afternoon. This is a busy morning. We will do a Treetop Walk, visit the Whangarei Falls and visit “Kiwi North” (Museum – Kiwi House – Heritage Park). After lunch we then drive north along the Pacific Coast to our destination for tonight – the picturesque town of Russell, the heart of the Bay of Islands, once known as the “Hell Hole of the Pacific”. Again we will follow the coast road and arrive late afternoon where we will be staying 2 nights in our wonderful accommodation. 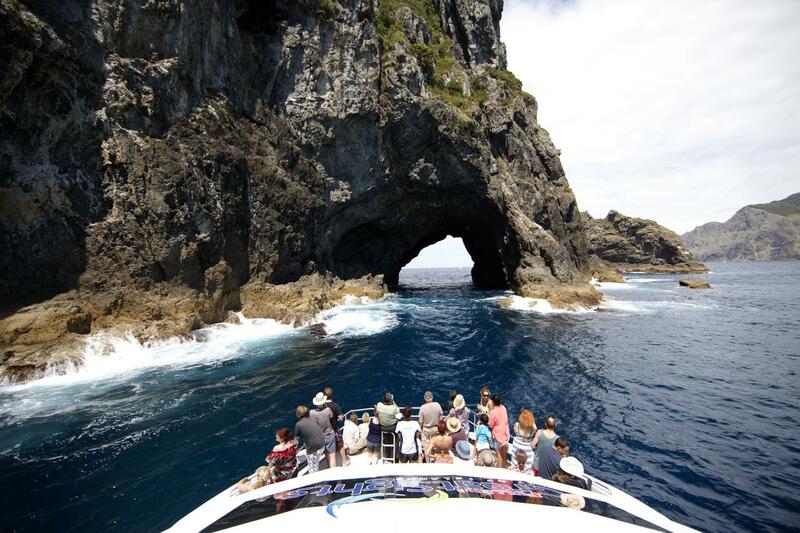 There are many attractions and activities on offer – if you like being on the ocean you could take a 4 hour boat trip to the famous “Hole in the Rock”. This is a fantastic experience. A bonus is a great chance to witness pods of dolphins. After lunch you could then explore historic Russell the birthplace of New Zealand soaking in the history, cruise the shops or just relax on the waterfront or back at your accommodation. Today we leave Russell behind and take the car ferry at Opua then to the town of Kawakawa to see the famous Frederick Hundertwasser Public Toilets and his other creations. We then head to the coastal town of Paihia which is directly across the harbour from Russell, then onto Waitangi to visit the Museum and discover Maori Culture of New Zealand and the Peace Treaty that was signed by Maori and Pakeha on this site in 1840. This resulted in the declaration of British Sovereignty over New Zealand by Lieutenant Governor William Hobson. Late afternoon we take a short drive onto Keri Keri where we stay for 2 nights. This morning we visit the Historic Stone Store, Rainbow Falls, explore Keri Keri Town, a Chocolate Factory and do some shopping or relax with a bottle of local wine and plan where we are going for dinner. Then back to our accommodation for the second night. Kaitia is our destination this evening. In the meantime we will drive inland and walk amongst the huge Kauri Trees at Puketi Forest Park (accessible) and then northwards to a beautiful spot for lunch – theMangonui Fish Shop & Takeaways nestled on the edge of the Manganui Harbour. With full tummies we then enjoy a scenic drive from the east coast to the west of Northland where we will stay in the northern town of Kaitaia for 2 nights. Today we travel to the northern most point of New Zealand – Cape Reinga here we come!. At this point New Zealand has become very narrow. Coast to Coast is just a morning stroll!. On our return we will stop at the Gum Diggers Park at Waiharara before returning to our accommodation in Kaitaia and planning our dinner choices. Today we go south keeping to the west coast stopping at the historic village of Kohukohu on the edge of the Hokianga Harbour. It was one of the first European Settlements in New Zealand and by the 1830’s was the heart of New Zealand’s Timber Industry reaching a population of 2,000 but today just 150. We then take a short drive to another carry ferry this time across the Hokianga to Rawene on the south side of the harbour from where the first shipment of kauri was taken out in 1822. We then travel along the southern side of the harbour which stretches 30 km from the Tasman Sea. Here there are the twin settlements of Opononi and Omapere at the entrance to the harbour which is where we will stay the night. After a short drive from our hotel we will visit the South Head Lookout on Signal Station Road. The view out to the Tasman Sea and back into the Hokianga is spectacular. A definite photo opportunity. We then head inland and climb into the Waipoua Kauri Forest where we find “Tane Mahuta” the largest kauri known to stand today and estimated to be some 2,500 years old. We will stop at the Waipoua Forest Headquarters for lunch and then onto the coastal Kai Iwi Lakes where we will be staying for our last night of the tour. We travel south through Dargaville and then to the Matakohe Kauri Museum where you will get an appreciation of the real historical significance of how the development of Northland was a result of the might of the Kauri Tree which is now totally protected. After lunch – sad goodbyes as we travel on to Auckland for your flight home. Meals & Refreshments Your expense with the exception of all breakfasts and 3 dinners specified. If you would like to know more please feel free contact us at any time.